The Institute is like a mini-town. Along with our great catering facilities we have an extensive sports centre and gym, our Graduate Salon’s hairdressing and beauty facility and iSpace, the place to go for peace and quiet when you’re reading or studying. 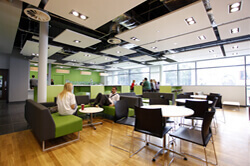 Within iSpace you will find a range of computers and laptops which you can use to help your studies. There is also the Reading Garden which is ideal for quiet reading, with access to resources including online books and journals as well as help with assignments. Our newly refurbished and extended refectory is open until 5.30pm (4.30pm on Fridays) and is the perfect place to relax and unwind, whether you want a quick snack, a healthy lunch or just to catch up with friends. 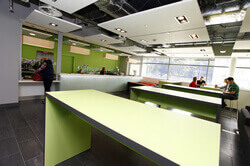 The new café area serving freshly ground coffee is set to be a favourite haunt with learners this year. Breakfast is served every weekday from 8.15am until 10.15am, following which a huge choice of multi-cultural foods are available including a range of premium sandwiches, healthy meals, pizzas, salads, paninis, wraps, and jacket potatoes. With most meals costing less than £3, it’s not only tasty, it’s also affordable. Don’t forget we also have a FREE healthy breakfast available to our learners, every day from 8.15am-8.45am. Our shop offers a wide selection of magazines and newspapers, a textbook ordering service, a range of groceries and confectionery and, of course, stationery and essential study materials. The Campus Shop café also offers a range of Costa Coffee hot beverages to drink in the café or take away. Costa Coffee has a classic barista service that is available to all of our staff and students at a fantastic price. Rated 5 stars by North East Lincolnshire Council. When you need some peace and quiet to read or study, our Learning Resource Centre offers a bright and welcoming space and is equipped with PCs and printers for individual or group study and research. The Learning Resource Centre is located on the first floor in D block and offers a wide range of resources in various formats, including books, magazines, newspapers and DVDs. A quiet study room is also available as well as a group study room that can be booked. Free Wifi is available across the campus so you can work from your own laptops to research and study online. Our £4-million Sports Centre has a six-court Sports Hall that is used daily for enrichment activities. The fully-equipped gym offers learners the chance to train and work out, with a reduced membership rate exclusively for students. The Multi-Use Games area (MUGA) is made up of artificial pitches which are located next to the Sports Centre. They have been designed for learners, staff, local sports clubs and community groups to use throughout the day and evening for football and hockey on an artificial grass pitch. Grimsby School of Art is the home for the Grimsby Institute’s colourful range of Creative Arts and Media courses. This three-storey building boasts a theatre, dance & rehearsal studios and a range of workshops for courses including jewellery making, ceramics, fine art, sculpture, graphic design and textiles. 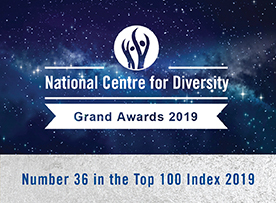 Make sure you check out the exciting events and shows that take place in the theatre and exhibition spaces throughout the year, many of which are free. For learners who need childcare services, our award-winning Little Stars Day Nursery is based at our Nuns Corner Campus and offers care for children from three months to school age. The warm, caring and highly qualified staff will ensure your child’s individual care and will offer advice and guidance on all aspects of their development. Our e-print facility offers all learners a range of printing services including assignment printing, photographic printing, bookbinding and finishing and stationery. There are copiers and printers located in the Learning Centre for students to use with print credit that they can purchase. Our brand new Logistics Hub has been designed to meet the growing need of industries in our region. With the continual growth in areas such as Offshore Wind, Warehousing, Environmental Technologies, Road Haulage and Portside Operations, this £7.5-million centre of excellence will include individual and team training suites and simulators for offshore vessels and portside and offshore lifting. Sources reveal that by 2022, there is expected to be 64,672 people working in the logistics sector in our region alone, earning between £15k and £46k. Set your course to our new Logistics Hub; there has never been a better time to train in this thriving and promising industry. On the ground floor of UCG students can relax and enjoy a bite to eat in the Atrium, UCG´s spacious cafeteria. Students can choose from a delicious range of hot and cold snacks including a sumptuous range of sandwiches and daily specials. 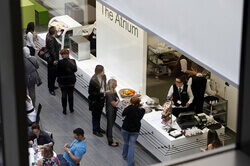 The Atrium also offers a Barista service, with a range of hot and cold drinks available throughout the day. Throughout the day the Corner Lounge offers a range of hot and cold beverages including Costa Coffee and freshly prepared Paninis. In the evening the fully licensed Corner Lounge is a great place to catch up with friends after a day of study. It also holds events, specialist nights and is available for private hire. 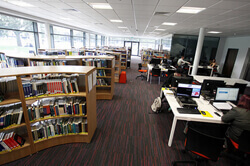 The Higher Education Learning Centre is set out over two floors and is home to 32,000 publications. It offers 24-7 access (except for approximately 14 days throughout the calendar year) for students with an independent self-service facility, which allows students to borrow, return and renew books. 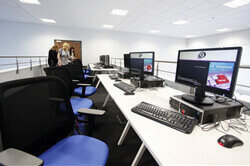 Situated on the First floor of UCG is our industry standard Media Centre. Here students have access to a motion capture studio, visual effects and virtual news environment, full green screen, soft TV studio for live sofa journalism, games design room, photography studio, three creative labs and three seminar rooms. Also situated on this floor is the Higher Education Learning centre and an outstanding open IT space. 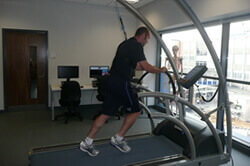 Situated on the second floor is Health and Social Care and Science along with the Sports Performance lab and clinical skills room which house a range of exercise ergometers which are used by students to develop their learning in the elements of sports and exercise physiology. Situated on this floor is an open access IT space. The third and fourth floor house the Business Management area and Computing department along with several lecture theatres, a Teacher Training and Education facility, boardroom and open access IT space. The Gallery Restaurant in the hospitality department is run by the learners in this area and offers a unique lunch and dinner menu that’s ideal if you want to treat yourself or enjoy a relaxing lunch break. The menus are changed termly and offer a wide range of reasonably price meals for you to choose from. Bookings during term time can be made on 01472 276137. Indulgence Bakery offers a delicious range of snacks, prepared every day by our Hospitality learners. The range of sweet and savoury snacks includes freshly made sandwiches that can be tailored to your taste with a variety of fillings that are prepared every day. The Grimsby Institute has its very own Hair & Beauty Salon – The Graduate Salon, where you can take advantage of fantastic discounts or even get free treatments through The Enjoy Programme by simply downloading vouchers to your personal learner email address and booking yourself in. The campus care park is open to students, staff and members of the public who are visiting our site. Vehicles must be parked in designated parking places only. Vehicles must not be parked in areas hatched in yellow, on yellow lines, in locations where Health and Safety issues arise, (eg blocking fire escape routes) or in such a way that causes obstruction or inconvenience to other users. This rule also applies to Motorcycles which should also be parking in designated areas only. The campus car park is private property where all vehicles are parked at the owner’s risk.